Cleveland, OH (January 4, 2018) – New vehicles sales rose 2.7 percent in 2017, when comparing the year to 2016, according to figures released today by the Greater Cleveland Automobile Dealers’ Association (GCADA). Across Northern Ohio, franchised new vehicle dealers sold 253,111 new vehicles in 2017, up from 245,474 new vehicles sold in 2016. 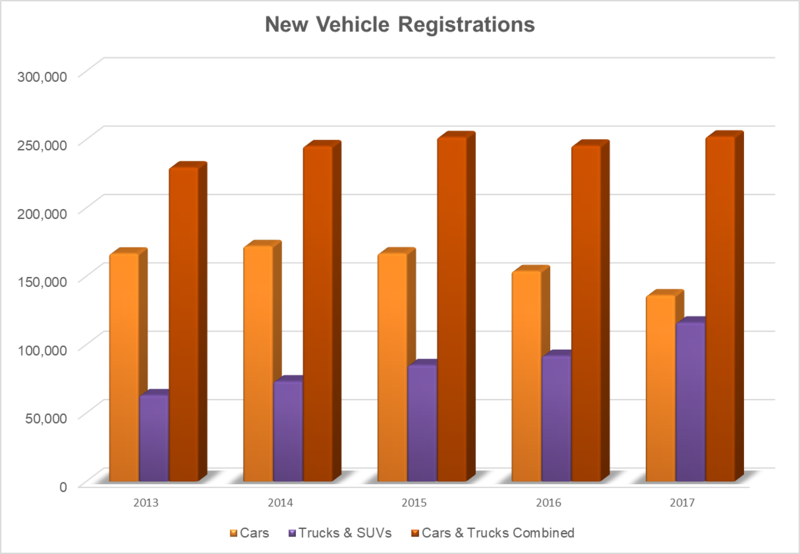 Used vehicle sales also ended up in the black, with dealers selling 201,038 used vehicles in 2017 compared to 196,765 units in 2016, an increase of 2.17 percent. For the month of December, new vehicle sales took a hit, with dealers selling 4.98 percent fewer cars and trucks than they did in December of 2016. Used vehicle sales were also slightly off for the month, with dealers selling 3.41 percent fewer used vehicles last month than they did over the same time period a year before. Dealers are anticipating another robust year in 2018, with sales remaining essentially flat or off one or two percent compared to 2017. Sales of trucks, crossovers and SUVs drove the industry throughout 2017, with Northern Ohio dealers selling 116,087 new vehicles in 2017, compared to 91,751 new vehicles in 2016, an increase of 26.52 percent for the year. When comparing December 2017 with December of 2016, sales of trucks, crossovers and SUVs rose 5.59 percent for the month. Chevy dealers sold 2,975 new vehicles in December, capping off a year that saw Chevrolet overtake Ford for the title of best-selling brand in Northeast Ohio. Ford sold only 23 fewer vehicles for the month, however Chevy dealers rang up sales of 39,469 total new vehicles in 2017, compared to Ford’s total of 38,854. While Ford ended the year marginally ahead of 2016 (plus 0.29 percent), it was still not enough to best Chevrolet’s year end increase of 6.85 percent. Honda saw sales rise by 2.21 percent in 2017 with 22,093 new units sold to take home third place, while Toyota came in fourth with 19,857 new vehicles sold in 2017. The following brands posted sales increases in December of 2017 versus December of 2016: Acura, Alfa Romeo, Audi, Cadillac, GMC, Lexus, Maserati, Mazda, Mini, Mitsubishi, Nissan, Porsche, Ram, Subaru and Volvo. The following brands posted sales increases for the year in 2017: Acura, Alfa Romeo, Audi, Buick, Chevrolet, Ford, GMC, Honda, Hyundai, Jaguar, Jeep, Kia, Maserati, Mazda, Mini, Porsche, Ram, Subaru, Volkswagen and Volvo.